Just 2 percent of New Canaan remains without power, according to Eversource, or 187 homes. All known hazards had been made safe as of about 7 p.m., according to the New Canaan Office of Emergency Management. New Canaan Public Schools are expected to open as usual on Monday, according to the OEM. Power has bee restored to all but approximately 317 New Canaan homes, according to Eversource—evidence, according to the New Canaan Emergency Operation Center , of the “significant progress” that crews made overnight. “Currently, we have 10 roads that are impacted with downed trees and wires—although all are passable by emergency vehicles,” the EOC said in an update on its Facebook page that also went out as a town-wide call. “Eversource crews will be working this morning in the following areas: Hillside Road, Deer Park, Stonehenge Drive and Sunset Hill. Remember to treat all downed wires as live and do not move any barricades or caution tape … Eversource is still estimating that they will have ‘substantial’ power restoration by 9 pm tonight. Remember that single service repairs can take longer and your power could be interrupted while crews work to restore power in your area. Eversource says it’s restored service to many of the homes that had lost power Saturday, with 331—or 4 percent of customers—without power. The town had opened up access to all town roads for emergency vehicles as of 6:30 p.m. Saturday, according to the Office of Emergency Management. Eversource crews on Saturday night worked on Weed Street, Dan’s Highway, West Road and Talmadge Hill. According to the OEM, “Eversource is estimating that they will have “substantial” power restoration by 9 pm tomorrow night. Power has been restored to the New Canaan Y and it’s open to anyone in the community who wants to use its locker rooms and showers through 9 p.m.
Eversource says that 955 homes in town or 11 percent of New Canaan remains without power following the high winds Friday into Saturday. About 19 percent of New Canaan homes, or 8,452 Eversource customers, remained without power at 1 p.m. Saturday, according to the utility company. Town officials opened the Emergency Operation Center to coordinate town-wide restoration efforts, according to Emergency Management Director Mike Handler. 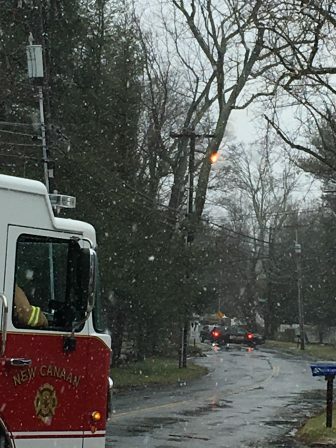 As of about 10:30 a.m., 23 percent of New Canaan was without power, and 31 roads had downed trees and wires. Residents should use 203-594-3500 to report non-emergencies and reserve 911 for true emergencies. All power outages should be called into Eversource at 800-286-2000. Ten percent of New Canaan homes—851 houses—are without power as of 6 p.m. Friday, according to Eversource. 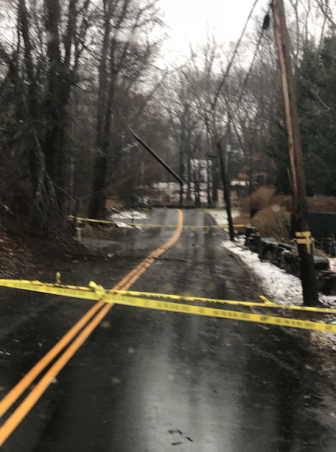 Emergency responders fully and partially closed a number of New Canaan roads Friday as high winds brought down branches on power lines, knocking out power to nearly 500 local homes as of early Friday afternoon. Police close off Ponus Ridge at Davenport Ridge Road on Friday afternoon due to a power line fire. Credit: JJ Clarke Jr. The National Weather Service issued an urgent High Wind Warning for the area that will remain in effect until 6 a.m. Saturday. Winds will range from 25 to 35 mph with gusts up to 60 mph, according to the weather service. The strongest winds will come through Friday afternoon and night. At about 3 p.m. Friday, a tree fell on a pickup truck on Canoe Hill Road, trapping and injuring a driver. Dans HWY is also closed.